With its very impressive and high class look the 12′ x 6′ Traditional Heavy Apex Shed is a good sized shed that is sure to be very popular. 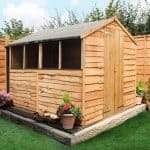 Being 12 x 6, the shed is offering you a whole lot of storage room, but not at the expense of taking up your whole garden. As well as the floor space, you have a very generous amount of headroom which makes it so things can be stored quite high and it also means that walking around is a comfortable experience. The shed has a lot of style and a huge part of this is those six horticultural glass windows that are one side of the shed, two of these actually open so on a hot summer day, you can let in a nice breeze. This is part of the heavy line from Treetops Traditional and as a result it has been made with very high quality materials. To start with holding it all together is their signature round edged, 44 mm x 44 mm frame. While strong, the shed also has a very pleasant look thanks to the charming, tongue and groove shiplap wall cladding. The long apex roof is made with tongue and groove boarding to keep out the rain. This same kind of boarding is what is used for the floor and it is able to take a lot of weight. Here we have the interestingly sized, 12′ x 6′ Traditional Heavy Apex Shed. This is offering you a very generous amount of storage space so you are going to be more than able to keep a whole lot of things in here. The shed in the picture is this same model, but it is a much smaller version, this one we are talking about is nearly twice the size. The depth of the shed is 12 feet which is the largest this style of shed comes in. 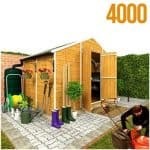 But despite that vast amount of depth as the width is 6 feet, you will find that this shed can fit into most gardens. It is a very interesting design choice having a width that is half the size of the depth, but it works very well. We always like how Treetops Traditional sheds are a little bit higher along the eaves, 6 feet 1 is the eaves height which is a few inches higher than the norm. Along the ridge the headroom is a very impressive, 7 feet 8 inches. We really like how this long apex roof looks and as well as being very pleasing to the eye it is also well made. On the very top we have waterproof felt that will protect the boards from the rain, snow and anything birds and cats want to do up there. The boarding is 12 mm thick, tongue and groove boarding which is some of the best boarding you can get for a roof. The walls are made with tongue and groove shiplap cladding and we just love the way it looks. This cladding is made from very top of the line redwood and is a very solid, 12 mm thick. We are very pleased with how durable this cladding is, not to mention how nice it is to look at as well. Inside the shed and standing right behind the cladding is the reason why Treetops Traditional are able to put heavy in this sheds name. 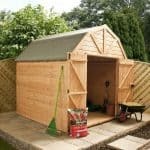 This is one of the most impressive frames of any shed, at 44 mm x 44 mm and with rounded edges, you will find that this is one of the strongest sheds you have ever seen. 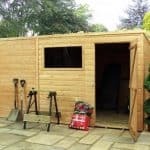 It is the kind of shed that when you do give it a little nudge or tap, you can tell right away just how robust it is and this is all down to that incredible frame. There is a lot of floor space in this shed so to make walking around here feel great and also so that you can store many heavy things like a mower, tool benches or even the kids swing and slide when winter comes around, Treetops Traditional have used strong 12 mm tongue and groove boards for the floor. If these sound familiar it is because these are the same boards that are used for the roof. This is a shed that is going to give you 20 plus years of service, but the redwood will need a little help from you in the form of a generous coating of wood treatment. This should be done shortly after constriction and also on a yearly basis after this. The shed will stay rot free as long as you do this. The wood is given a free basecoat treatment before delivery, but this is only going to look after the shed for a couple of weeks at the most. You are protected from rot, decay and any other issue the materials may have thanks to a one year guarantee. There is a 2 feet 6 inches wide single door on the shed that comes with a door handle and is attached to the shed with three high quality hinges to prevent sagging. One awesome thing that Treetops Traditional do is allow you to change the style of the door to a stable style door. Pictured is a double door which is over 4 feet wide, this can be added as an extra at a cost of, £53.99 and is something that is worth thinking about if you are going to be using this as a workshop or storing large items inside. The shed pictured has three windows, but this particular model we are talking about has an incredible 6 windows. These are made with strong horticultural glass and four of these are fixed with two of them being windows that can open. If you think you will be getting all hot and sweaty inside this shed and those two opening windows are not going to let in enough fresh air. Then you can upgrade the other windows so that they can also open for £31.99 per window. 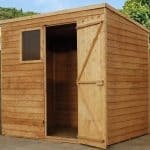 This is very strong shed that comes with a lock and key so your belongings are going to be safely locked away in the 12′ x 6′ Traditional Heavy Apex Shed. Something like a pad bolt could be easily added and for very little cost as well. 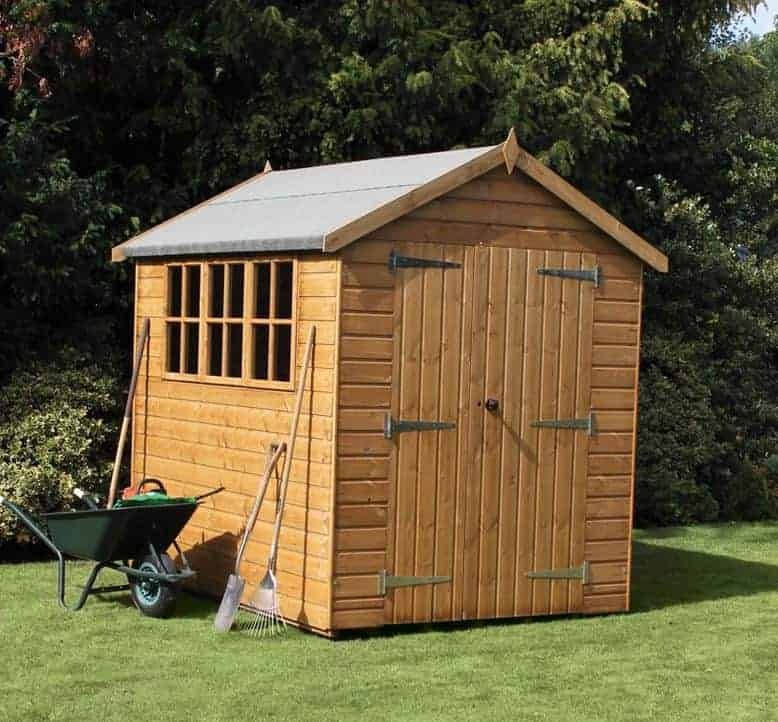 So there are a few cheap extra security measures you can take if you want, but we think the lock and key the shed comes with should be enough. This shed has six windows that take up one side of the shed so as you have guessed, privacy is not something this shed offers. They do offer the option to have the shed, fully boarded so that there are no windows at all, but if this sounds a little extreme to you, you could always just get some blinds or a set of curtains to give yourself a little privacy. The door and the windows are things that you can change and have a say in, but another and fun way to shake the style of the shed up a little bit is with coloured wood treatment. The wood is a nice brown shade, but you can brighten, darken or even change the colour with the right kind of wood treatment. We already talked about the windows and the door upgrades, but there are some other things that you may be interested in also. First of all we have an installation service. This costs £144.99 and will see them take care of all the lifting, hammering, screwing and anything else that installing the shed involves. You can give the floor a little bit more support and also lift it a little bit off the ground with the wooden floor bearers set. These cost an extra, £47.99 which is quite a fair price. We really love how high quality this line of sheds is and this larger model is just as high quality as all the rest. The heavy duty nature of the shed means that if you treat it on a yearly basis then you will get well over 20 years of use out of this. We always find it very interesting when a shed has a very large depth mixed with a smaller width or vice versa. On paper it sounds like it would give the shed a weird shape, but it works very well and the end result is you having a whole lot of storage room to play with. Before you build there are three things you need. A friend to help, a pot of coffee and an overflowing biscuit tin. Oh and the instructions might help as well. This is a large shed so it will take you around 3-5 hours. To be fair even for a person who is a novice when it comes to DIY, it should be a straightforward project. While just under a thousand pounds is certainly no small chunk of money. 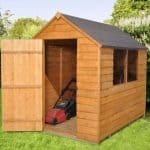 We still feel that because of the storage space it offers, materials used and the clever design that this is still a shed that is good value for money.